Ben Stapley is video director at Liquid Church in Mountainside, New Jersey. 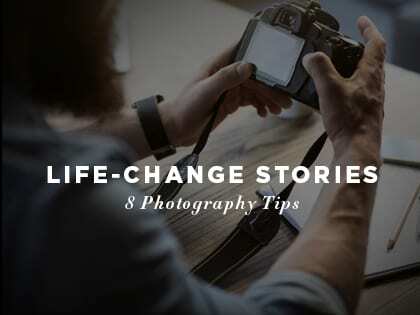 He guest blogs at unSeminary.com, and here he shares tips on how to use photos to help share the most important message—that everyone is unfathomably loved by God. 1. Take candid—not posed—photos. Posed photos focus on how the subject looks. Candid photos focus on what the subject is doing. Prevent the comments section on your social media platforms from digressing into a back-and-forth of who looks more adorable. 2. Remember to get establishing and concluding shots. What did it look like when people showed up? What did it look like when they left? These shots frame the event within a storyline. Without these shots, it feels like you came to the party late or left early. 3. The most natural storyline is straightforward. It has a beginning, middle and end. This chronological approach might feel formulaic, but it works. If you can find a better structure to the three-act story, great. If not, use it. 4. Capture a range of compositions: close-up, medium and wide. Use composition to your advantage. Take the wide shot when you have a group of deadpan teenagers clustered together on their phones. Wait for someone in that cluster to look up from his or her phone and show some emotion before zooming in for the close-up. 5. Capture a range of people. Don’t just shoot your friends or the photogenic people at an event. Capture the widest range of those present. I can often tell who my college photographers have a crush on when I review their photos. 6. Capture a range of perspectives—get under, over, behind, beside and close to your subject. If the subject seems boring from your current perspective, change your position to make it more dynamic. 7. Be observant for key moments that are “loaded” with emotion, meaning, significance, surprise, etc. Better yet, anticipate moments that are about to happen so you can position yourself well to capture them. This anticipation means you’re thinking through your upcoming shots even as you deal with your current shot. It’s a skill that can take awhile to master. 8. Shoot for emotions. Most of the photos will be used to demonstrate the life-changing power of Christ. Try to capture that power photographically. If you want to capture joy, take photos of baptisms. If you want to capture peace, take photos of a candlelight service. If you want to capture boredom, take photos of the annual church meeting! While social media is a great tool for marketing ministry, there are protocols. Simply stated, you cannot post pictures or videos of minors without parental permission. Small church or a very large ministry—this applies to everyone. Legally, you cannot show any “recognizable” photo of a child, which means that you can post a photo from the back of a head or if their face is blurred. The best practice is always to protect yourself and the children in your ministry by having written permission from the parents of every minor whose picture you might show on your website or on any social network. I hereby grant permission for [church or ministry name] to record pictures or videos of my child [minor’s name] while on the church property or at a church-sponsored event. I also give permission to [church or ministry name] to use these images or videos in church print and online publications including church websites and social networks.